The children of Delabole Community Primary School have recently been busily exploring and celebrating their whole school value - Trust and Collaboration - under the banner 'How are we stronger together?' This journey culminated last week in an extraordinary promenade performance of "Orpheus and Eurydice" across three afternoons. It started with a wedding. We were all invited to a joyous celebration and The Fates guided us to the ceremony. But it was not to be. Caught in the coils of a deadly dance of death, our beautiful Eurydice was bitten by the adder and drawn down into the underworld – Hades’ Kingdom. From there she could never return. But Orpheus could not, would not, let her go. Following Orpheus down into the underworld, on his quest to find Eurydice and strike a bargain with Hades, we were led by The Fates through a sequence of stages: The Plain of Asphodel, Tartarus and the Elysian Fields. We crossed the dreamlike River Styx and laid down our memories to be carried away by the River of Souls. And finally, we entered the court of King Hades and Queen Persephone. ‘You may take her – but make sure you don’t look back’ were his words…If only he had trusted her to be right behind him. The moment he turned to gaze into her eyes, she was gone forever, unleashing all the beauty of the world in her memory. A courageous venture in itself deciding on who to follow to the ends of the Earth, made even more so considering the children involved were as young as 4 years old! 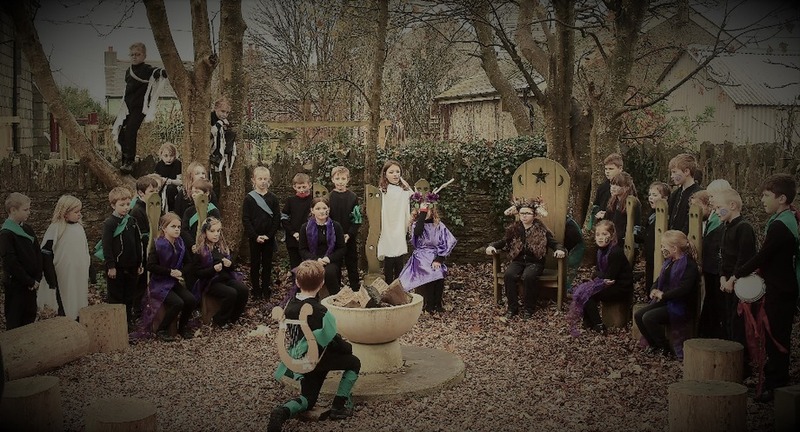 An amazed audience were taken on an emotional journey through the classic Greek tale, which was orchestrated across different parts of the school environment. A huge thank you to the children and staff of Delabole Community Primary School for their creativity, energy, resilience and enthusiasm, and equal thanks to our supportive and receptive audiences. Truly an unforgettable and spellbinding experience delivered by a trusting tribe of talented storytellers. A spellbinding performance by a tribe of talented storytellers.